The irony is hard to miss: the two daughters of celebrity chef Emeril Lagasse can’t enjoy many of his signature dishes. Jessie Lagasse Swanson has gluten intolerance and her sister, Jilly Lagasse, has celiac disease. The diagnoses were a big blow to the foodie sisters. After all, it’s hard to imagine New Orleans staples made by their father — like gumbo or po’ boys — without wheat flour. After going gluten-free, the Lagasse girls, as they call themselves, quickly grew tired of eating rice cakes. They tinkered with family recipes, eventually figuring out the secret to revamping their old favorites to fit a gluten-free diet. Now they’re sharing what they learned in “The Gluten-Free Table”, a cookbook they published last fall. Emeril – himself the author of several cookbooks and host of cooking shows on the Food Network and Cooking Channel – wrote the foreword and contributed 10 recipes. Swanson, the older sister by two years, is a former certified public accountant who lives in New Orleans with her husband and two young sons. Lagasse, a makeup artist who has worked on her father’s TV shows, divides her time between New Orleans and London. 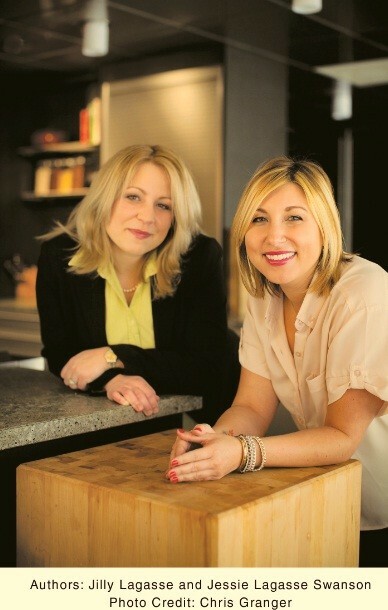 “The Gluten-Free Table” is just the beginning for the Lagasse sisters. Gluten-Free Living recently talked to them about the cookbook, their famous father and plans to expand their gluten-free empire. Mary Beth Schweigert: What’s it like to be the daughter of a famous chef but need to follow a restricted diet? Jessie Lagasse Swanson: I think it’s funny, but I really believe all things happen for a reason. It really helped our father become a lot more aware of dietary restrictions. It’s nice to see how his sensitivity for that has grown over the years. It’s helped him with empathy. Jilly Lagasse: At first it was quite difficult, and I think our dad just thought we were trying out some new crazy diet as usual. Soon he saw just how ill I would get if I did accidentally get ‘glutened,’ and that this was no fad diet but a serious medical condition that forced us all to change the way we cooked and ate. Now the whole family prefers to have gluten-free quinoa for our big Sunday dinners. What’s really sweet is whenever we go out to eat, either my dad or my little brother, E.J., will passionately tell the wait staff that I have celiac disease and cannot have any gluten. MBS: When were you diagnosed? JLS: In 2000, my father took me to Italy for my 21st birthday. I lost 10 pounds. I was sick the whole time. It was really, really difficult. Finally I went to a doctor and she listened to my whole story and said, ‘You had a lot of wheat products over there in Italy, didn’t you?’ … It turned out I have a sensitivity to gluten and a host of other foods. It took six months of me being really, really sick for somebody to figure it out. JL: I wasn’t properly diagnosed until 2004, when I moved to London. My new doctor asked if I had any ailments. As soon as I gave him my laundry list of symptoms, straight away he said it sounded like celiac disease (or coeliac, as it’s spelled there) and that it would be just a simple blood test to find out. Within two weeks of getting my diagnosis and strictly following a gluten-free diet, my whole life and body had changed. MBS: How did you react to your diagnosis? JLS: I was devastated. I went to this itty, bitty Whole Foods on the end of the French Quarter. I remember going there and thinking, ‘What am I going to do? I can’t eat anything. I don’t even like vegetables.’ After that initial panic period, it was really fine. It just took a little more effort. I was able to compensate with other things that I enjoyed. JL: At first, my reaction was complete shock and confusion. So you’re saying I’m allergic to bread? And pasta? Really? Then it was the panic of how will I be able to eat anything or anywhere? After getting advice from my sister and doing lots of online research, my panic and confusion slowly melted into joy and excitement. I finally knew that something really was wrong with me and that now my body might start to heal. Getting properly diagnosed changed my life, and I don’t know if I’d be here today without it. I can’t imagine just how ill I would be. MBS: What was the biggest struggle for you? JLS: For me honestly the hardest thing was going out to eat. At the time I was single and in my 20s. I went out to eat seven nights a week. I never ate at home. All of the sudden, I would go out and nobody knew about gluten sensitivity or how to answer whether something was gluten-free or not. It took a long time to figure out what I could eat safely. Now everybody knows about it. Restaurants advertise on their menu that they have gluten-free offerings. And the products. The regular grocery store has a whole row that’s gluten free. How far we’ve come in 10 years. JL: I had to change the entire way I lived my life. We are very much a food family, as you can imagine, and food, cooking, going out to eat — that is all joy to me. Changing how I approached all that took a bit of time and adaptation. At the time of my diagnosis, celiac disease wasn’t as known, and the cookbooks that were out were just boring, to be honest. I didn’t want a life of rice cakes. I still wanted all the food I had grown up eating and sharing with my foodie family. The struggle is what fueled Jessie and me to write a gluten-free cookbook. MBS: What is your favorite of your father’s dishes? Is there a gluten-free version, and is it as good as the original? JLS: If I had to pick one, it would be baked stuffed shrimp. He used Ritz crackers for that nice buttery, salty part of the filling. I think that was my favorite thing that he made for us. I actually did it in the book. I used gluten-free butter-type crackers. JL: This is so tough because everything he makes is my favorite. But my all-time favorite Daddy dish would have to be his Christmas Gumbo, chock-full of duck and spicy Cajun andouille sausage. We have successfully made a delicious gumbo in our book that is pretty darn close, and I actually prefer it. Just don’t tell him that. MBS: Which of your father’s conventional dishes is the hardest to turn down? JLS: The only one — and we’re working on it right now but haven’t quite got it — is a really good fried fish or chicken. Down South, people fry everything. I have to admit I actually sometimes cheat and have his fried fish. I just cannot quite get (the gluten-free recipe) right. MBS: Does your dad make any special gluten-free dishes just for you? JL: He is just the best when it comes to catering to our food allergies. Whenever I’m home and he is cooking for the family, it will always be a gluten-free meal that we all eat together. He does this incredible veggie and pork stir fry with bean thread noodles that is legendary in our family. Also, he’ll make a big pot of Bolognese sauce that he serves with gluten-free quinoa. MBS: When you were growing up, did you feel like it was expected that you would be a good cook? JLS: Our dad thought cooking was an important skill for us to have. He’s a great teacher. I would spend hours watching him and ask a lot of questions. He very patiently answered them. By the time I was in my mid-20s, I had a pretty good culinary portfolio. My sister had it more as a natural gift. When we were kids, she could just throw stuff together and it would usually come out tasting really well. Me, I had to actually learn it. JL: I do think it’s just something that comes naturally to me, and I was more than likely to be a good cook just from all the time I spent in the kitchen watching and helping my father. I was always interested and fascinated by it all and just wanted to learn more and more. I remember begging my father to let me go to work with him at the restaurant. I was relentless. He finally gave in and let me go and help out in the pastry department. There I was, a little gal in the kitchen with a piping bag full of whipped cream and an arsenal of fresh mint that I got to finish plates off with. I thought I had gone to heaven. MBS: Where did the idea of the cookbook come from? JL: The idea really was born out of frustration that Jessie and I both were feeling at the time of our diagnoses. Here we were, having to adapt to a new culinary life, and we couldn’t find one decent cookbook — well, what we considered to be a helpful and useful cookbook. Sure, there were baking books with ingredient lists that would send me into an anxiety attack. There were books of ‘everything on a rice cake, rice cake sandwiches, chocolate rice cakes, rice cakes with eggs.’ We refused to accept that gluten free had to be flavor free. So we embarked on a five-year journey of adapting all our favorite dishes that we still wanted to eat and be able to enjoy. MBS: How did your dad react when you told him you were doing a cookbook? JLS: We told him when it was done. It took five years for the whole thing to come together. We said, ‘Dad, here’s the book. It’s actually finished. Do you want to write the foreword to it?’ He was surprised. He is supportive, but he doesn’t do it for us. He’ll help us, he’ll contribute recipes, and he’ll write the foreword. But he’s not going to call a publisher for us. He’s not going to get his friends to write it for us. It makes the end result a lot more fulfilling. You earn it, and it’s not just handed to you. MBS: What’s it like to work with your sister on a book? JLS:We had our good times and our bad times. We had our moments of ‘Wow, we did this,’ and ‘Oh my gosh, I don’t ever want to talk to you again.’ If you had to balance it out, it was a really good experience. It helped with our relationship in a lot of ways. It taught us a lot about each other. It gave us an opportunity to spend a lot of time together when we hadn’t really had that since we were kids. JL: It was great to get to work together on something we are both so invested in and feel so passionately about. It was very typical sibling stuff though. We had tears, we had laughter — we had it all, honey. For me, it was a wonderful experience and one I hope we get to experience again. MBS: How did you come up with the recipes in the book? JLS: They’re mostly the foods we actually cook for our families on a regular basis. A lot are cornerstones of our everyday cooking lives. It’s a pretty diverse table of contents. At the same time, we’re real people. We’re not going to pretend we have time to make a gluten-free Ritz cracker from scratch. If there’s a good gluten-free product out there, we’re not going to re-create the wheel. JL: I like to think of the flavor profiles I like and try to create something new and exciting from scratch. I love to take the dishes I enjoy eating in my daily life and elevate them a bit or put my own twist on them. It’s a lot of trial and error for me, a lot of experimenting – but that is the fun for me as well. MBS: What is your favorite gluten-free recipe? JLS: The baked stuffed shrimp is my favorite. If I had to pick another one, it would be the smothered pork chops or the cornbread and andouille dressing. But I probably have a favorite or two from each chapter. JL: The gluten-free recipe that I am most proud of in our book would be our version of our Great Grandma Cabral’s Banana Nut Bread. It’s one that took me ages to crack, but once I did, it was like I was transported right back to being a child in her kitchen and taking a bite of her famous banana bread. It is a complete food memory and makes me think of her every time I bake it. I love that people can live on through their recipes and the memories you have while eating them. MBS: Is there a gluten-free dish that you haven’t yet perfected? JLS: Really right now it’s the fried chicken. … We’ve got the spices and seasonings right but just can’t get the texture. JL: We have yet to master the perfect gluten-free French bread loaf, which is absolutely essential for another dish that we have yet to master: a gluten-free fried shrimp po’ boy. We’ll crack it eventually. It just takes time, patience and a lot of gluten-free flours. MBS: What kind of response have you gotten to the book so far? JL: We’ve gotten a wonderful reception within the gluten-free community, and everyone seems to be enjoying it. We get people asking for another one, so I guess that’s a good sign. MBS: What’s next for you? Are there any other books in the works? JLS: We’re exploring our options. We’re looking into doing some of our own packaged products. We’re working on a new cookbook with classic comfort foods, like green bean casserole and stuffing for Thanksgiving. We’re just really trying to educate people in any way that we can. JL: We have a lot of exciting things in the works. We’re slowly but surely trying to build our little gluten-free empire. There is a lot of gluten-free goodness to come from the Lagasse girls. MBS: Any plans for a TV show? JLS: We have some feelers out there for that right now. I think we’re open to anything. JL: I would love to see a gluten-free food program on television, be it a cooking program or a travel program. It’s time. That’s my dream, to be part of putting gluten-free food on the map and on TV. Plus, I think we might know someone who could offer a bit of advice on that.